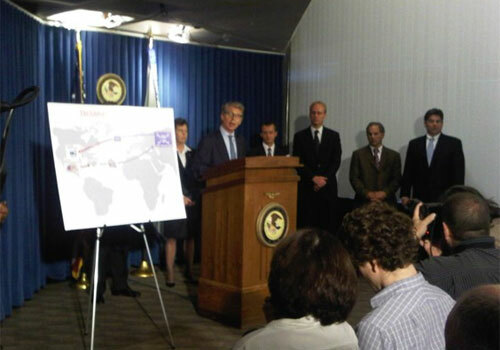 Manhattan DA Cy Vance Jr. discusses the criminal enterprise behind the Zeus crimeware at a press conference Sept. 30. Zeus has been a major problem for computer users and financial institutions over the past few years. Once installed on the victim’s PC, the malware can be used to log into a victim’s bank account and transfer funds to another account controlled by the criminals. The U.S. arrests involve so-called money mules, people who are paid to set up accounts that receive stolen funds and then move the money out of the country, typically via a wire service such as Western Union. The DOJ has scheduled a press conference in Manhattan on Thursday afternoon to further discuss the arrests. According to documents seen by IDG News Service, prosecutors have filed a total of 26 complaints. Investigators from the agencies including the U.S. Federal Bureau of Investigation and State Department special agents describe in the complaints an elaborate network used to launder funds stolen by the Zeus malware. One of the complaints describes in-depth the use of money “mules” in order to facilitate the transfer of funds into criminal accounts. Mules agree to allow funds to be transferred out of victims’ accounts into their own accounts. Those funds are typically quickly withdrawn and wired elsewhere before banks detect the fraud. But that was a risky job, involving withdrawing cash from the banks either in person or visiting cash machines, both of which would be under video surveillance. “The mule organization typically recruited mules from Eastern Europe who were either planning to travel to or were already present in the United States on J1 visas,” according to the complaint lodged against three individuals: Artem Semenov, Almira Rakhmatulina and Julia Shpirko. The J1 visa is a non-immigrant visa granted to people such as students. When those mules arrived in the U.S., they were given fake foreign passports in order to open more bank accounts. Stolen funds were transferred to those accounts in amounts close to $10,000, according to the complaint. “The mules kept a portion of the fraudulent proceeds for themselves — usually 8 to 10 percent — and transferred the rest to other participants in the fraudulent scheme,” the complaint said. Semenov, Rakhmatulina and Shpirko were charged with conspiracy to commit bank fraud and conspiracy to possess false identification documents. Semenov and Rakhmatulina were also charged with false use of a passport.